1. Yes, there was actual tender coconut water sold at the festival. It was 50 bucks, but that was the minimum price for food and drink coupons, probably a fair price for a festival that seemed like most of South Mumbai’s hipsters with a second home showed up, with their dogs, of course. 2. The people, the mats and seats placed around in front of the stage really did mean it was a relaxed environment. 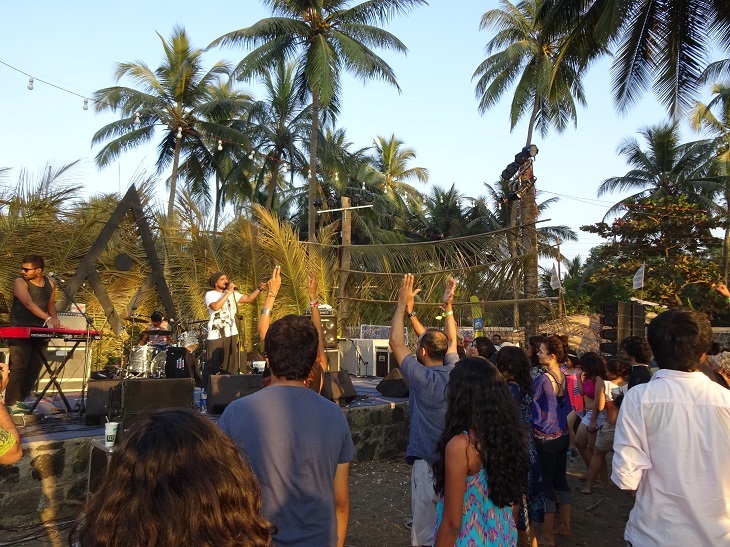 But that’s why bands such as Mumbai world/indipop act Achint and Delhi psychedelic rock band Begum respective energy and lethargy didn’t really do much for an afternoon by the beach on day one. 3. Festivals are all about the experience – but you really have to ask whether that experience is sipping some cocktail by the bar behind the stage or catching London-based beatboxer Bellatrix impress even before she started using a backing track. Unfortunately for her, the party moved elsewhere when she started singing over her loop-station. 4. Some of them definitely climbed up the rock barricade to catch the sunset view from the beach in Mandwa. Finally, a festival (that isn’t Ziro Festival of Music) that offers a good view and a good sound. And probably smoke a spliff or two that they really weren't checked for due to the lack of security at the festival entrance. 5. You can have laze-around music in the day, but Nariyal Paani picked up the pace by the evening, with French reggae/ska/dub band Jahneration throwing in a real diverse, immaculate sound and Delhi’s very own reggae band The Ska Vengers knocking ‘em down, with trumpet player Kishore Sodha’s powerhouse work. 6. One still wonders how Samara Chopra aka Begum X manages to do all that jumping and hot stepping in heels. Maybe because it was her birthday and she just wanted to go nuts? I hope, for her sake, they’ve got a foot masseuse somewhere in their tech rider. 7. Prateek Kuhad has got a lot more angst in him with new material. To all those girls who love his music, you’re going to be standing next to a few shattered dudes soon. Yet another target audience unlocked for the Delhi singer-songwriter. 8. Mumbai electronic artist Nicholson has got no new material, unless you count his mostly-instrumental interludes between the regulars such as ‘Cold Water’ and ‘For What’. He did have new merchandise, though – tanktops in pink and black. 9. New York City’s indie rock band Ranjit and the Ambassadors were just plain weird - from showering flowers from the stage to freestyling about the plastic bag it came in, before using said plastic bag as a prop whistle. You could still enjoy his jams, especially if you like a medley of ‘Knocking on Heaven’s Door’, ‘Ziggy Stardust’ and ‘Stairway to Heaven’. 10, Closing off the official festival line-up (by about 6 pm) were Mumbai’s electro band Laxmi Bomb, who sound like a newer, more explicit Pentagram with songs like ‘To Say’. They even had accordion player Mynah Marie, from Montreal, adding excellent hues to existing material like ‘Reggae Rasiya’.